Kerry O'Flaherty was 0.40 seconds outside the Commonwealth Games 3,000m steeplechase consideration standard as she produced a season's best in Gothenburg on Tuesday night. The county Down runner, 35, clocked 9:54.40 as she finished eighth at the Folksam Grand Prix meeting. O'Flaherty's time was three seconds inside her previous season's best set last week in Hungary. Meanwhile, Leon Reid clocked 20.57 to finish fifth in the 200m in Lucerne. The Northern Ireland athlete, who booked his Commonwealth Games spot by improving his personal best to 20.38 when finishing a surprise third at the recent British World Championship trials, was competing at the Spitzen Leichtathletik event. Jamaican duo Nickel Ashmeade (20.37) and Warren Weir (20.44) filled the first two places while Switzerland's Alex Wilson (20.46) and American Dedric Dukes (20.47) were also ahead of the Bath-based Reid, who is hoping to transfer international allegiance to Ireland. 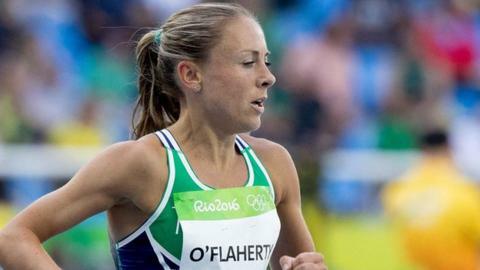 Rio Olympian O'Flaherty will compete again in Belgium on Saturday. O'Flaherty, who set her personal best of 9:42.61 in 2015, was out of racing for over a month after tearing a calf muscle at a British Milers Club meeting in Solihull in May. After struggling in a number of races on the continent following her injury, the Newcastle athlete was under 10 minutes for the first time this season in Hungary and then clocked 9:59.46 in Letterkenny on Friday night. Twelve Northern Ireland athletes have already achieved Commonwealth Games considerations standards although it is far from certain all those with the Gold Coast marks will be selected for the trip to Australia next Spring. The Gothenburg race was won by Kenya's Caroline Tuigong who clocked 9:35.57 ahead of American Katie Landwehr (9:37.00) and Britain's Lennie Waite (9:37.94).